When you drive through the Kings Lake subdivision in southern Hillsborough County, you may notice nice homes, well-kept yard and cars parked at odd angles across driveways. The strangely parked cars are the result of an ongoing battle between residents and the Homeowners Association. “The community is saying that parking on county roads that we live on is illegal, that according to our bylaws that they have amended, that you are not allowed. 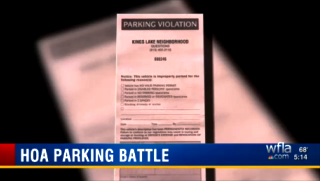 That you are not allowed to park on the county street,” said LeRoy Vanek, who lives in Kings Lake. Vanek contends his HOA has no right to enforce parking regulations on county streets. “We are not a gated community. These roads, we do not have a CDD, these roads are owned by the county. They are maintained by the county and governed by the county,” said Vanek. Stephanie Folckemer is another resident who is not happy with the HOA enforced parking rules. “In my opinion, this more points out that there is an issue in this neighborhood. If I, coming in as a buyer, and saw all these cars parked this way, it would be something that would deter me from wanting to buy a house in here,” said Folckemer. Both Folckemer and Vanek contend it’s just one HOA board member who is trying to push the strict rule of no parking on the street. Homeowners recently had an election to replace existing HOA members. They voted in new members who intend to change the parking rules, according to Folckemer and Vanek, but the HOA election results are being contested and the board member who is at the center of the controversy is refusing to leave the board. A tow truck recently showed up to remove a car parked on the street. The tow truck driver was pinned in by angry residents and a Hillsborough County sheriff’s deputy had to be called to resolve the situation. Hillsborough County Sheriff’s Corporal Larry McKinnon says an HOA can enforce parking rules, up to a point. 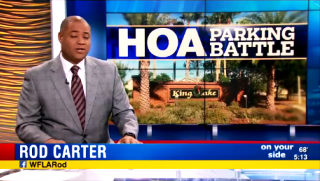 “What they are issuing is violations of an HOA, it has nothing to do with Florida state statutes. It has nothing to do with county ordinances, it’s therefore all completely civil,” said McKinnon. Homeowners are now fighting the contested election and hoping to gain control of the HOA to change the rules.